Microsoft appears to be taking a hint from Google, encouraging staff, interns, etc., to get creative and “turn their wild ideas into real projects”. On the Microsoft Garage site, they are sharing some of these new tools. One of the new applications they’ve published is “Snip” for Windows. Snip (download it at mix.office.com/snip) is a screen capture and annotation tool that also includes a whiteboard. It makes it really easy to create instructional video ‘snips’ by writing or drawing on a screen shot or on the white board screen. The resulting video can be saved as an MP4, or you can get a link to it, email it, or embed it! The first time I tried it, it took me less than 10 minutes to download and install it, create an example video, and save it as an MP4. There are other tools around similar to Snip, but the Garage team has combined a few functions not necessarily found in those to create a tool that is easy to use but still delivers several key functions in one app, like mark up, voice annotation, and easy distribution options. Imagine the myriad ways you can use such a tool to create instructional video clips! Bring up an image (art work, a photograph, a famous building, a map, a molecule, a planet, a formula, etc.) or some text (a poem, a page from a novel, a news article), narrate over the image, write on it or highlight sections, and save and share your resulting video clip in a snap. 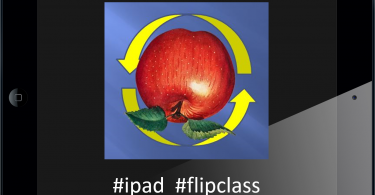 It’s clearly a powerful aid for the new or experience flipped classroom instructor. In addition to being able to learn from teacher-made instructional videos that they can access with ease and review, rewind, and replay, students can also use Snip for creating content for projects and assignments. They could also use it as a study guide, making their own video clips reminding them how something works or going over key points about a topic, and so on. Or help a classmate understand something they might be struggling with. Another excellent use for a tool like Snip is to provide technical assistance. Trying to explain to someone how to do something on the screen over the phone? Create a quick snip or two and show them. Have a common issue with an application that keeps rearing it’s head? Use Snip to show how to avoid, resolve, or work around it and share it with all of your users. Snip can also be great for illustrating how to use a new tool or function. Those who are used to full screencasting tools may find Snip frustrating, because you can only capture portions of screens and then record as you annotate them. This is not quite as powerful as a full screencasting tool, but good screencasting tools are not cheap, and free ones don’t often provide this kind of mark up capability. You can get a step closer to screencasting functionality by making multiple Snips. Extending on that idea, a simple way that I could see to make Snip even more powerful would be to provide a function to allow users to combine multiple Snips into one MP4 file. So go ahead now … go get your Snip on!